Check out Copper Hills Wrestling's YouTube Channel with Wrestling Technique Videos from camps, clinics, and by special guests to our team's practices. The Sponsor Page will help any person or organization who plans to sponsor Copper Hills Wrestling or a specific Wrestler on the Copper Hills Wrestling team. You can join our seasons by registering at any of our practices. Just bring the current Registration Form to the next practice. A USA Wrestling card in needed in order to participate in our Fall/Winter & Spring (V-Style) Seasons. Chance's story has been documented by our local news stations over the last two years. We are happy that they were there last night to share Chance's amazing night with everyone. Senior night in January 2014 will be a night that will remain in our hearts forever. 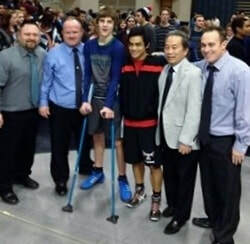 Our beloved teammate, Chance Sackett wrestled for the first time since his shooting accident. Chance is truly an inspiration to us all!